Damion and Heather are from the USA. 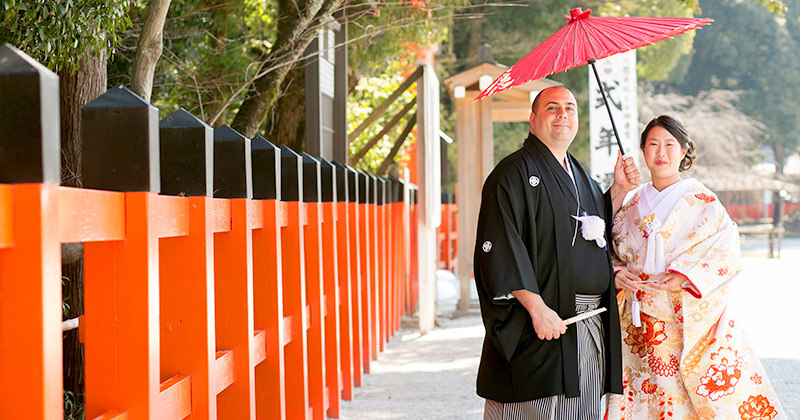 They held their wedding ceremony at Kamigamo Shinto Shrine. After the ceremony, they had a photo shoot at Arashiyama. It was a sunny day, a little bit cold, but for Damion and Heather the weather was perfect. Heather`s mother, brother and their friends also came to Kyoto to join their wedding ceremony. Her mother and brother and the couple’s 2 friends also dressed in kimono. This season does not have so many tourists, so they were able to relax and book a 9:00 ceremony at Kamigamo Shinto Shrine. We had a good time at the shrine and taking photos in Arashiyama. Dear Damion and Heather, congratulations! We hope the wedding ceremony in Kyoto was a wonderful experience and that you made some great memories with your family and friends. You two are really a lovely couple. Hope we can meet you again in Kyoto!